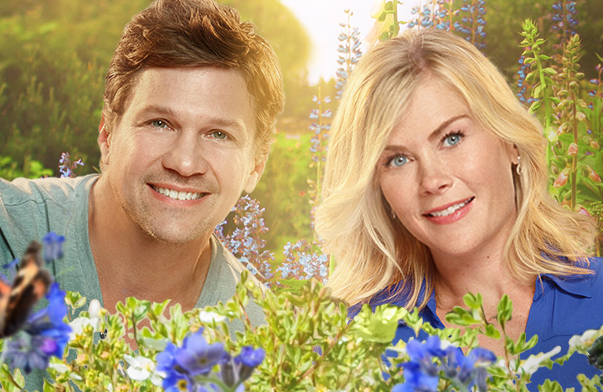 The Irresistible Blueberry Farm premieres October 2. Longtime Days of our Lives star Alison Sweeney (ex-Sami Brady) has a couple of new primetime TV projects coming up October. The Irresistible Blueberry Farm airs Sunday, October 2 at 9 p.m. ET/PT on Hallmark Movies & Mysteries. High-powered Manhattan attorney, Ellen Branford (Sweeney), is going to fulfill her grandmother’s (Shirley Jones) dying wish—to find the hometown boy she once loved and give him her last letter. When Ellen leaves her Kennedy-esque fiancé, Hayden Croft (Kavan Smith), to go to Beacon, Maine, she expects to have a quick twenty-four-hour stay. But a near-drowning experience leads her to become a local celebrity and introduces her to a man named Roy (Marc Blucas), a carpenter who saves her life. As Ellen learns more about the past her grandmother has kept hidden and works to bring closure to her quest, she may find that a twenty-four-hour visit to Beacon will never be enough. Kids Halloween Baking Championship airs Wednesday, October 5 at 8 p.m. ET on Food Network. Don't miss the premiere of Kids Halloween Baking Championshipwhen four fan-favorites from Kids Baking Championship return to bake their way through spooky new challenges and prove to hosts Duff Goldman and Alison Sweeney they have what it takes to win the $10,000 grand prize.